So I mentioned a few months ago that when I first found out I was pregnant, my first sign that something was up was that my skin freaked out. Now, so much skincare advice for pregnant women suggests using “mineral” sunscreen filters instead of organic “chemical” filters for various reasons, of varying levels of validity. But the primary reason I decided was because of the increased risk of skin sensitivity. And when my skin broke out in a rash, I decided to go to only inorganic filters (i.e., zinc oxide or titanium dioxide). But inorganic filters come with drawbacks: a thick feel, white cast, etc. So anyway, I started looking for inorganic sunscreens. There are plenty of recommendations out there. In fact, one of my favorite YouTubers, Renee at Gothamista, did a video about her favorite ones recently. And they’re also pretty easy to find at the store where we shop. After a few months of trial and error, I thought I’d share some of the formulations that I found myself reaching for over and over again. Now, one of the main issues I’ve had with inorganic sunscreens is that the formulations are not usually very cosmetically elegant. A lot of companies that make them focus on “natural” ingredient standards, which means they use a lot of plant oils and butters, leading to a thick product. Ironically, because the inorganic filters ingredients themselves are white powders, they can also make a product drying or mattifying. So plenty of the products I tried were too thick or too drying or both. And some products were great in the summer but to dry for winter. I’ve put together some of my favorites for both situations. Avene Mineral Ultra-light Hydrating Sunscreen Lotion: This was the first suggestion from Renee that I tried. And, wow, is it hydrating. Unfortunately, this was a bit too much for me in the summer when I first tried it, but I found it was great for the weekend when we went up to the Pocanos for the weekend in the early fall. It does leave a bit of white residue, but it’s great for lazy days. Just cleanse and slap it on. So this isn’t my favorite, but I do use it regularly. 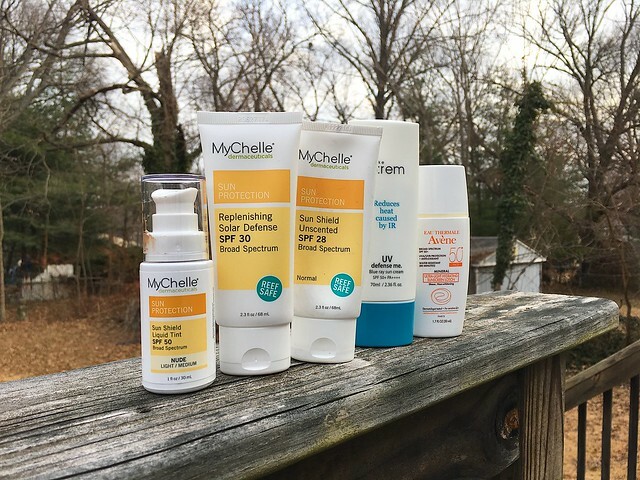 Mychelle Unscented Sun Shield: This is one I used frequently when I still sought out natural skin care products. It’s thick and white, but still manages to dry down to a nice texture. It does leave a little white residue in my eyebrows. And it’s dry in the winter. But for summer? Love it. Mychelle Sun Shield Liquid Tint: This was an impulse buy at the natural foods store, but I still use it every week. It’s tinted, but sheer enough that I can use a lot of it without looking like a mask. It just gives a little light coverage. This pretty much stays in my gym bag and I use it as a one-step sunscreen and makeup step when I’m rushing to get ready after barre class. Make P:rem Blue Ray Sun Cream: This is an interesting one. I don’t love this sunscreen, but I love the fact that I get only minimal white residue around my eyebrows even though it has SPF50. It’s a bit dry of a finish for winter, but I can see myself reaching for it more when the weather warms up. Mychelle Replenishing Solar Defense: And this is my current favorite. It’s lightweight, spreads easily, doesn’t leave a white cast on my skin, and feels lightly moisturizing (over a serum and cream, but hey, the East Coast has been going through some rough weather). I hope this will still work in the summer with fewer moisturizing layers underneath, but even if it doesn’t, it’s a great winter sunscreen for me. So that’s my roundup. If anyone has any other suggestions, let me know in the comments.